This trip isn't for the faint of heart! 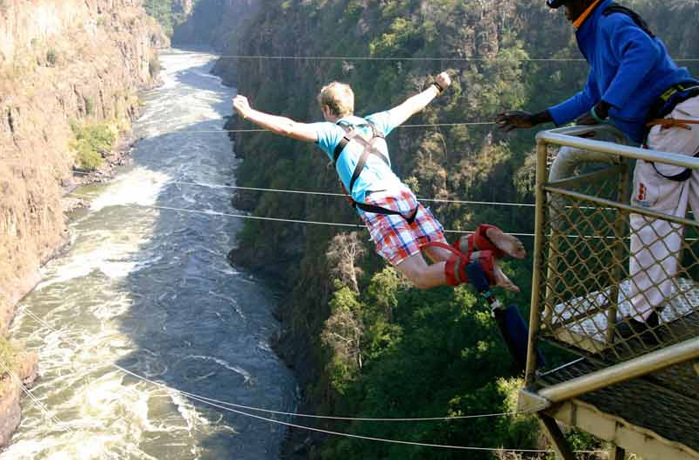 It has a thrill-a-minute itinerary that covers the best of adventure experiences in Rishikesh! You'll spend two exciting hours on a 16-km stretch of whitewater rapids, battling to take control of your rafts on Day 1. On Day 2, you'll enjoy a morning of cycling and trekking, but the highlight is the bungee jump from India's highest fixed platform, at a height of a 22-storey building. On Day 3, you'll head out to the river again, to take on the biggest rapids of the river. Put all your learnings into practice when you meet rapids like Roller Coaster and Golf Course. NOTE: This pricing is for one person in a group of 4 or more. If the group size is smaller, the pricing will increase. This high-adrenaline trip takes place in Rishikesh, India's adventure capital, and the gateway to some of the best treks in the Himalayas. During your trip, you'll be staying at a delightful beach camp on the white sands of the Ganges. You'll stay in Swiss tents on the beach, with the sound of the river always in the background. This trip involves some extreme adventure activities, so if you suffer from cardiac or respiratory conditions, or spine or knee problems, please consult your doctor before booking. Participants must adhere to the rules and guidelines of the resort at all times. Consumption of alcoholic beverages/drugs before or during adventure activities is not permitted. Please avoid littering, defacing or damaging the property and equipment rented to you. For cancellations made 10 days prior to trip date: 90% of the trip cost will be refunded. For cancellations made 7-9 days prior to trip date: 70% of the trip cost will be refunded. For cancellations made 2-6 days prior to trip date: 25% of the trip cost will be refunded. For cancellations made 0-48 hrs before trip date: No refund. The costs do not include unforeseen expenses due to natural forces, changes in weather, road blockages, illness, etc. No refunds are given for any unused services. You will be required to sign a Liability Waiver form before undertaking any adventure activity. You need to get to Bull's Retreat, Shivpuri, Rishikesh before 13:00 hrs. You'll eat a delicious lunch, and then hit the road to the rafting point. You'll take on a 16-km stretch of the rapids, ending with a dip in the calmer sections of the river. After that, you'll head to the beach camp which will be your home for the next two nights. A bonfire awaits, as well as hot cups of tea to warm you up. You can play some volleyball, go wading in the water, or just stare at the river and do nothing! Overnight in tents. After breakfast, you'll be briefed and then you begin your mountain biking adventure on Firefox mountain bikes. It's almost 2 hours of biking fun, and you only stop when you get to the bungee point. This is where you take that 272 ft leap of faith. You'll walk to the jump zone, your heart pounding, and then you'll be strapped into your harness. You'll have a rubber cord tied to your ankles, and then you head to the edge of the platform, and tip over! You'll feel a rush of air, your screams fill your ears, and then a sense of peace takes over. When your jump is done, you'll be lowered into the drop zone in the river where there is 2 feet of water. You can choose to ride back to the camp or take the car ride back to the camp. Overnight at your beach camp, exchanging bungee stories around a campfire. Today you head back to the river to take on some of the bigger rapids, especially Roller Coaster and Golf Course. After a tiring session, you'll return to Bull's Retreat for lunch, and to wash and change. After that, it's time to say goodbye. Trip ends here. Complete rafting equipment - dry bags, life jackets and helmets. You'll arrive at Bull's Retreat in Shivpuri, where you'll have lunch and then head to the rafting point. When the rafting is over, you'll proceed to the beach camp on the white sands beside the Ganges, in comfortable tents on twin sharing basis. The campsite also has dry pit toilet tents, and a dining tent, as well as a sit-out section with chairs, where you can relax and watch the river flowing by. Your tents are equipped with cots with mattresses, blankets, and pillows, as well as basic furniture like luggage racks and side tables. Today you'll eat a big breakfast, burn it all off on a rafting session, and then go to Bull's Retreat for a big lunch. After lunch, it's time to say goodbye and move onwards to your next destination.